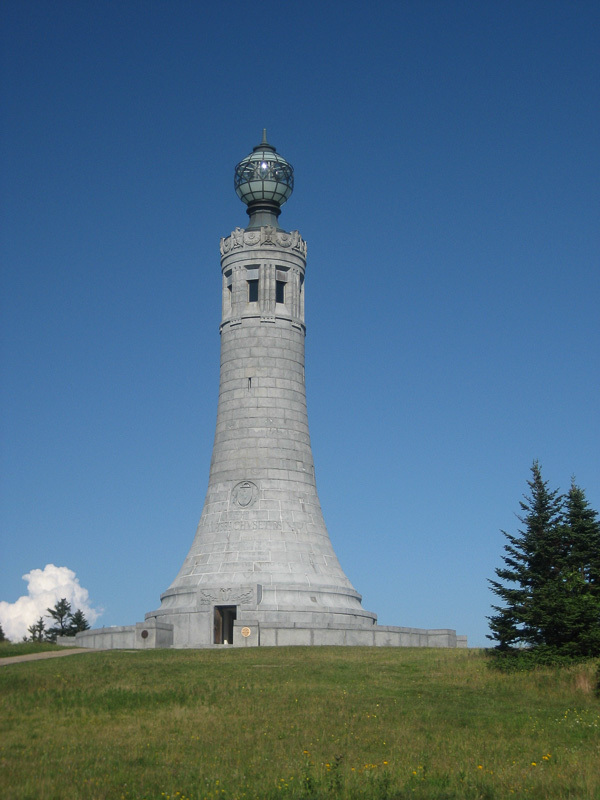 A 93-foot-tall lighthouse-like structure atop Mount Greylock, the highest summit (3,505 feet) in Massachusetts. Eight narrow windows at the top of the shaft give views to the surrounding landscape from within an observatory that is reached by two (or three?) spiral staircases. A semi-transparent glass globe sits atop a stem that emerges from the crown of the shaft; the crown is decorated with art deco eagles; the globe is lit at night, becoming a beacon. The exterior description is directly under a relief of the shield of the commonwealth of Massachusetts. An art deco eagle in relief surmounts the inset entrance to the memorial. The interior base of the memorial is occupied by a domed chamber. The dome is decorated with art deco patterns made from small tiles. A gold lantern hangs from the centerpoint of the dome. Two narrow rows of a laurel leaf pattern surround the center. Most of the dome is made up gold tesserae arranged in an overlapping pattern of half-discs. Under this is a narrow band of blue tesserae with red borders; against the blue-patterned mosaic are ranged 48 white stars. Below this are the interior inscriptions. The floor is made of different-colored marble that form a star-like pattern. In the center, inlaid in a circular black marble piece, is a bronze US, with the letters surrounding a bronze relief of a lit torch. Mount Greylock State Reservation, Notch Rd.